In our Beauty Extremist series, we interview people with a bona fide beauty addiction to find out what makes them tick and how they got hooked. For this installment, Jaime Maser of Maser Communications breaks down her epic hair straightening routine. Tell us about your flat-ironing routine from start to finish. Full disclosure: On an ideal hair week, I style my hair once by myself and have DryBar or Rita Hazan Salon do it another time, for a grand total of two wash-blow-dry-stylings a week. I preserve blowouts through workouts with the help of sweatbands and Jonathan dry shampoo. More often than not, it’s not an ideal hair week, and I can’t swing the professional blowout, so I’m left to my own devices. Thankfully, I have more than my fair share of product and tools to DIY my blowout. It starts in the shower with Brazilian Blowout shampoo & conditioner. Sometimes I use Living Proof No Frizz Shampoo and Conditioner — sulfate-free is key for me, since I get an amino acid hair treatment with Kim at Rita Hazan Salon a few times a year. Post-shower, I apply a touch of Shu Uemura Polishing Milk, MoroccanOil, or Living Proof Satin Hair Serum. Then I rough dry. (Harry Josh blowdryer = game changer.) Next, I spritz Garnier Fructis Style Sleek & Shine Flatiron Protector all over and clip hair into sections. I open my bathroom cabinets to create a three-way-mirror effect (no bumps in the back for me!) and start flat ironing. My flat iron tools of choice: Salon Tech with BaByliss mini for the “wings” (a.k.a. baby hairs along the hairline). 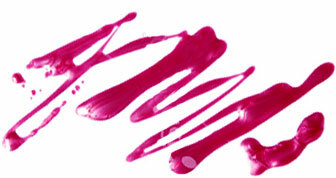 The finishing touch is a mist of Fekkai Brilliant Glossing. 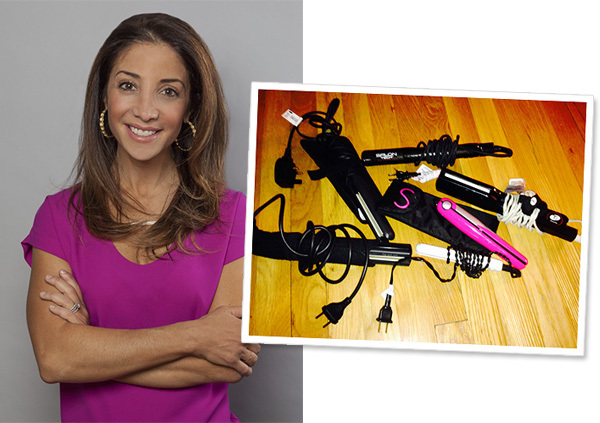 When did you get your first flat iron? How many have you gone through over the years? I was a late bloomer in the fancy flat iron arena. I didn’t get my first real-deal flat iron (moment of silence for that T3) until I had my first Brazilian Blowout, back in May 2010. Before that, I had naturally curly hair a la SJP in SATC, and when I did get a blowout, I relied on a good old-fashioned Conair Hot Tools to extend the life of my blow dry. That moment, post-killer blowout, when you leave the salon with a real pep in your step and renewed energy, owing the smile on your face to the boost of confidence that hairstyle is giving you. Gets me every time. As a flat iron connoisseur, which features make a good vs. bad one? Small but meaningful feature: a carrying case that doubles as a resting place for the iron when on, ensuring I don’t damage surfaces. Another must for flat irons: temperature options up to 400 degrees. You want to be able to control the heat. Lastly: something lightweight but powerful, the kind of tool gives you the look you're going for in one or two passes. Where's the weirdest place you've ever flat ironed? More airport bathrooms than I could name . And up in the air crossing the Atlantic or Pacific Oceans. Oh, so grateful for business class (and the electrical outlets in your pod) during international work trips. And in my husband's (but boyfriend at the time) pickup truck. It had an electrical outlet on the console. We were en route to PA to celebrate the Jewish holidays with my family. I was running late, not to mention frazzled and frizzy. Thankfully, I had the ride down on the New Jersey Turnpike to fix the frizz and show up at synagogue polished. What do other people who know you think of your routine? My closest girlfriends knew me when I had an aggressive curl routine that involved multiple products, steps and tools. Now it’s just on the other end of the spectrum. How many flat irons do you own? What's your favorite one and why? Six. Two international irons and four from the US. I was on the road and in the air a lot during my previous global PR post for La Prairie, so I stocked up. My go-to on the regular is the Salon Tech Silicone 450. It's powerful but gentle on hair, leaving it shiny and straight. And lately, I’ve been digging the Sarah Potempa Jetsetter Cordless Iron. Flat iron to go, no outlet needed? Perfect post-workout, pre-dinner. What is the most shocking hair OCD moment you've had? What would people be surprised to learn about you and your flat iron lifestyle? For the first 30-something years of my life, I rocked some serious curls, with only the occasional straight ‘do. And despite the number of hours I have logged in salon chairs and the access I have (being in beauty PR) to knowledge and tricks from some of the best stylists in the world, I still can’t manage to do any style on my own hair except sleek and pin straight. No volume, beach waves, etc.